Oh man, I have been longing for one of these since the project was first announced on the Lego Ideas site. 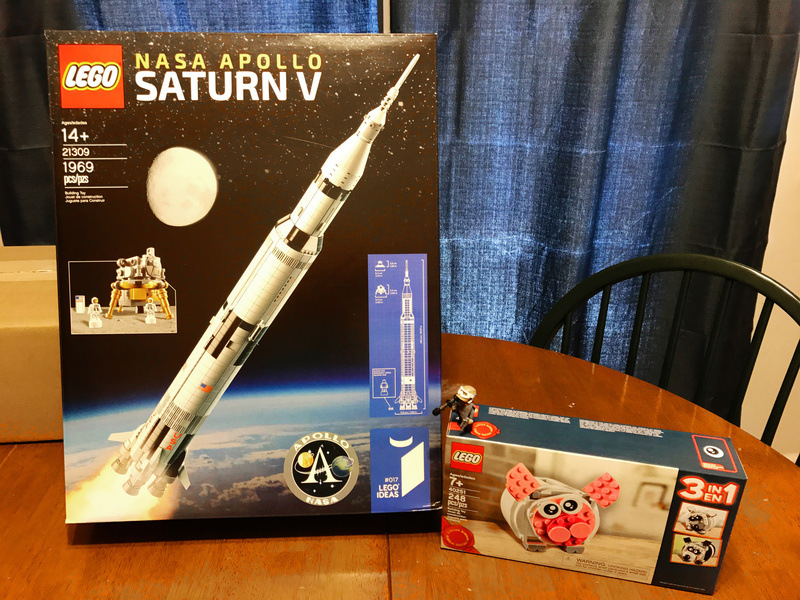 The set – officially the Lego 21309 NASA Apollo Saturn V – was released on June 1 this year and almost immediately sold out everywhere, with lots of the sets apparently nabbed by scalpers who turned around and started selling them for double or more the list price. A-holes. 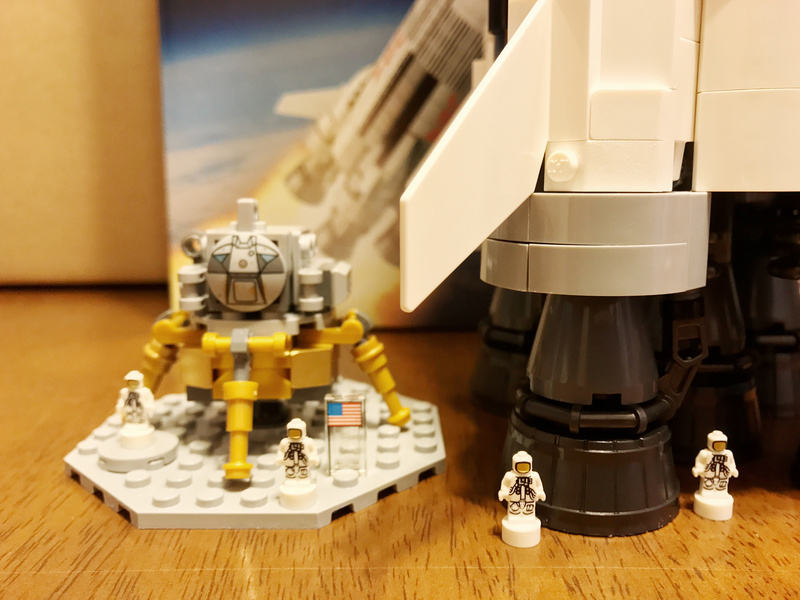 Aaanyway, I set an in-stock alert using Zoolert.com, and when the set was back in stock at the Lego.com store, I pounced. The Lego piggy bank was a limited-time promo freebie they threw in. Atop the piggy bank box you’ll see Lego Jyn Erso, who came over from London’s U-Wing set to help out by serving as a scale indicator. You’ll see her all through this post. Here’s the scale diagram from the front of the box. The fully assembled rocket is 1 meter tall, almost to the millimeter. 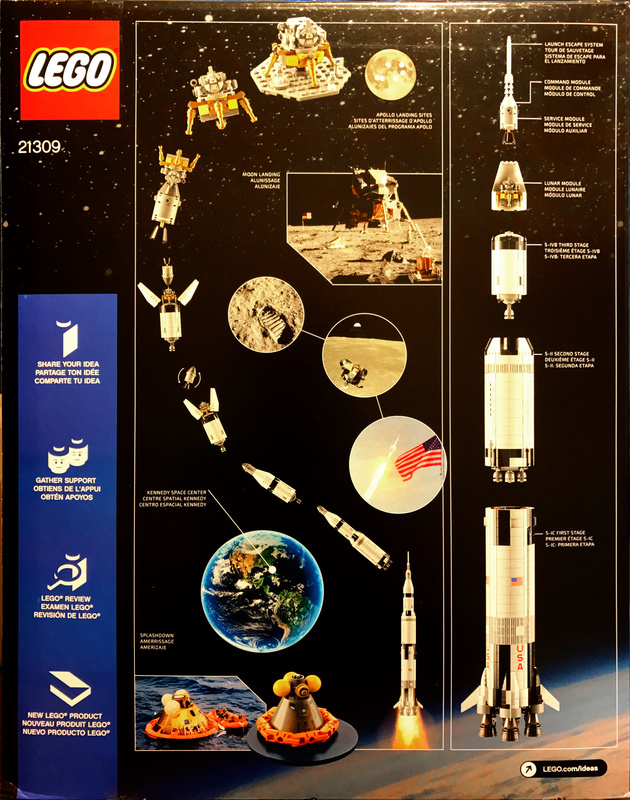 The back of the box, showing the full stack, the mission steps from launch to lunar landing, and splashdown. Inside the box: 12 numbered bags of parts, and a big fat book. The instruction manual is 200-page softcover book, with a capsule history of the Apollo program on the first few pages. 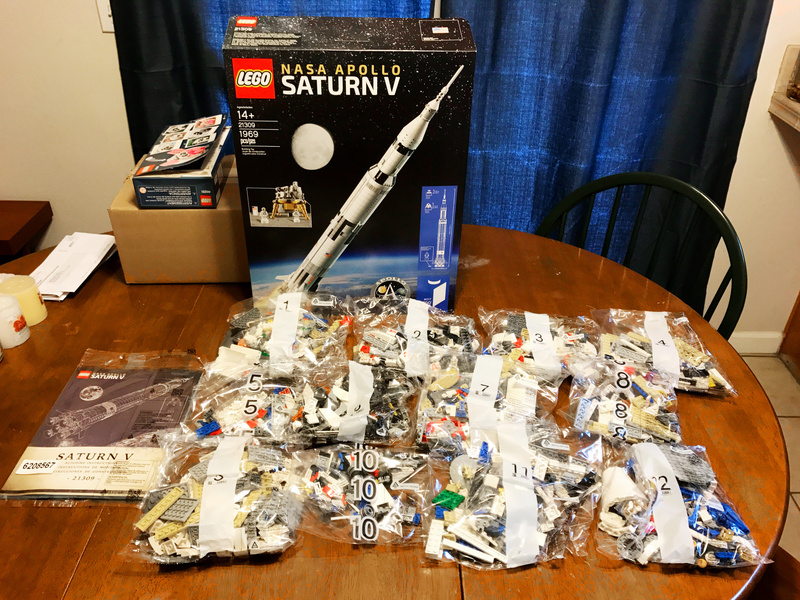 Of the parts bags, 1 through 6 are for the first stage, 7 through 9 have the parts for the second stage, 10 and 11 build the third stage, and 12 has the capsules and the little moon landing and splashdown dioramas. The completed first stage. I should have taken some in-progress shots. I was worried that this would be an unexciting build. Boy, was I wrong. The stages have fantastically complicated endoskeletons, with some of the most intricate, creative, and surprising building techniques I’ve ever seen. There are some good process shots here, and more at Late Night Astronomy, which you should be reading anyway. Here’s the second stage in progress. The endoskeleton is the multicolored box at the upper right of the photo, ready to receive the body panels which are laid out but not yet built here. I spread out all of the bits to confirm for myself that this stage alone uses 88 curved ramp pieces to contour the exterior of the second stage. The interstage connections at the top of the first stage (left) and second stage (right). The engines at the bottom of each stage are very realistic. I think these guts are less realistic, but those red clips do a pretty good job of grabbing onto the next stage up, so the assembled model is reassuringly solid. And the stages themselves are very sturdy. This thing begs to be played with. 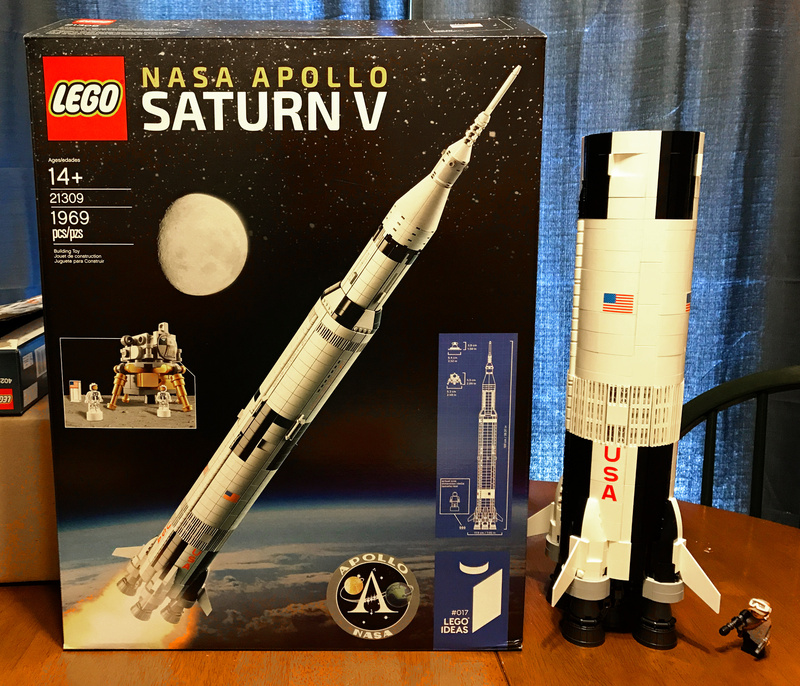 Way back in August, 2009, in the very first month of this blog’s existence, I posted about the Space Toys Ultimate Saturn V Rocket, which for many years has reigned supreme as “greatest space toy ever” in my estimation. Now there’s a new sheriff in town. 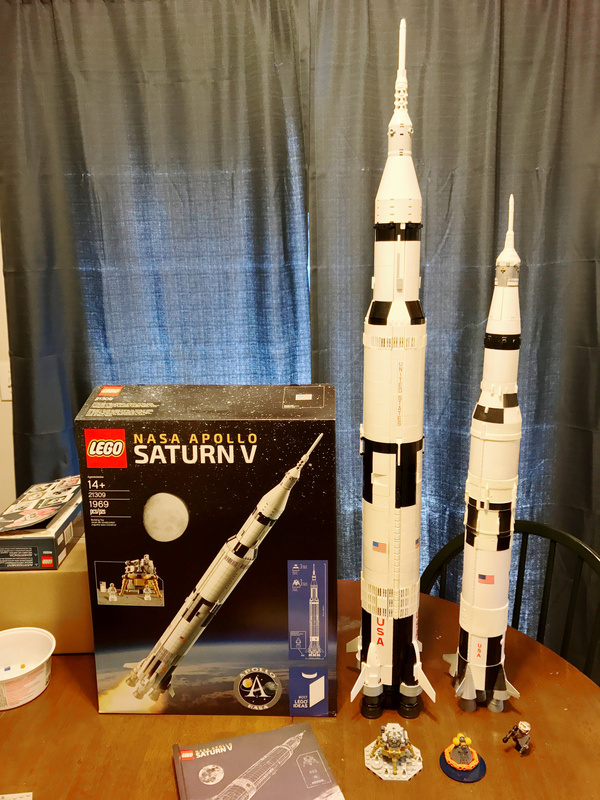 That’s the Space Toys Saturn V on the right, and the Lego Saturn V on the left. This photo does highlight one niggling inaccuracy in the Lego rocket: the first stage fins are far too swept back. Seems inevitable that someone will release a DIY hack for more realistic fins, if it hasn’t happened already. If you see one, let me know in the comments. 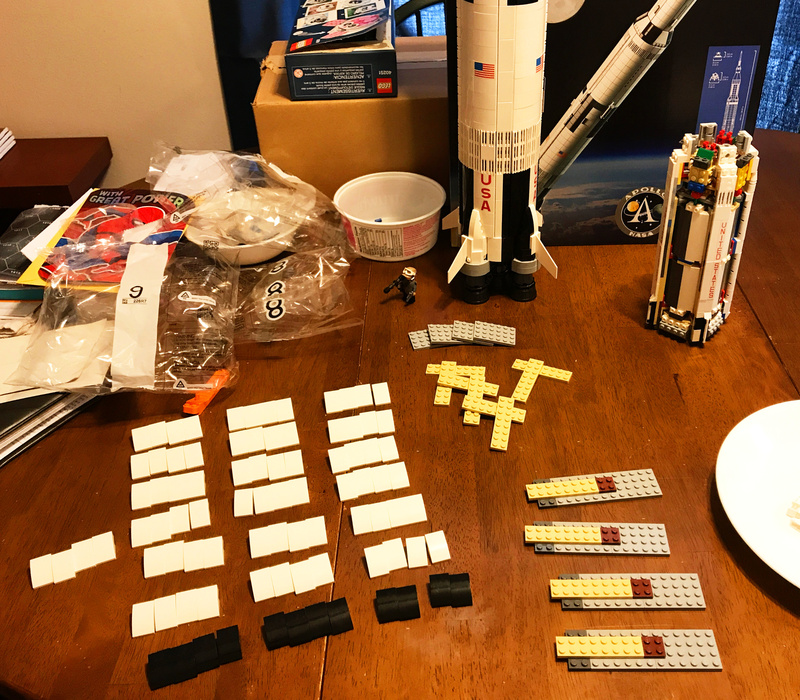 Here’s the Lego Saturn V broken down into some of its constituent bits. I could have separated the command and service modules from the third stage, but I was lazy. The LEM will fit inside the third stage fairing so you can re-enact the whole moon mission. Note the realistic J2 engines on the bottom of the second and third stages. All of the first, second, and third stage engines have translucent orange bits up inside the engine bells to simulate fire. I dig it. A close-up of the lunar landing and splashdown dioramas. London and I built the set by going through the bags in order, saving the capsules and astronauts as a payoff at the end of the process. That was good because it gave us something nifty to look forward to as we worked. 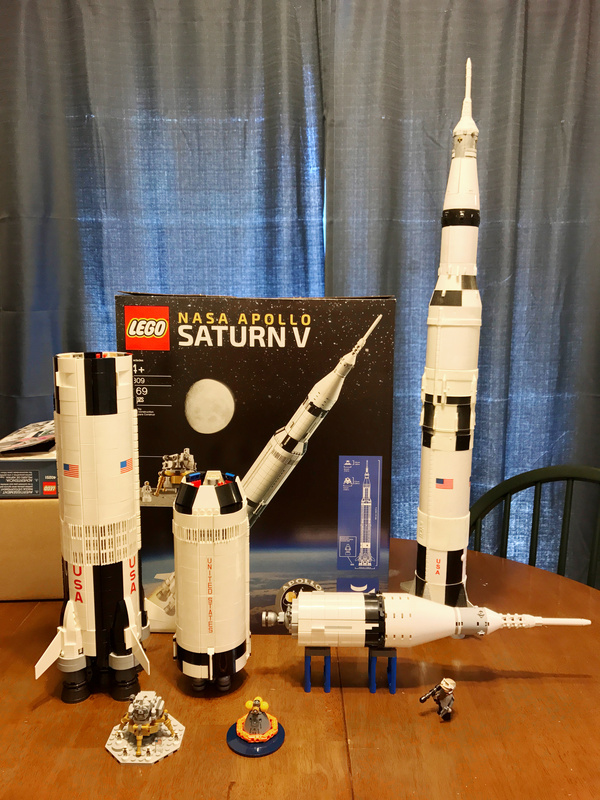 However, in retrospect it would have been nice to have some of the astronauts and maybe one of the dioramas in the first bag, so as we built the rest of the rocket we’d have a ready scale comparison to drive home the kind of insane size of the Saturn V. Hmm, guess I’ll just have to get another one – for the office, of course – and build it in a different order. 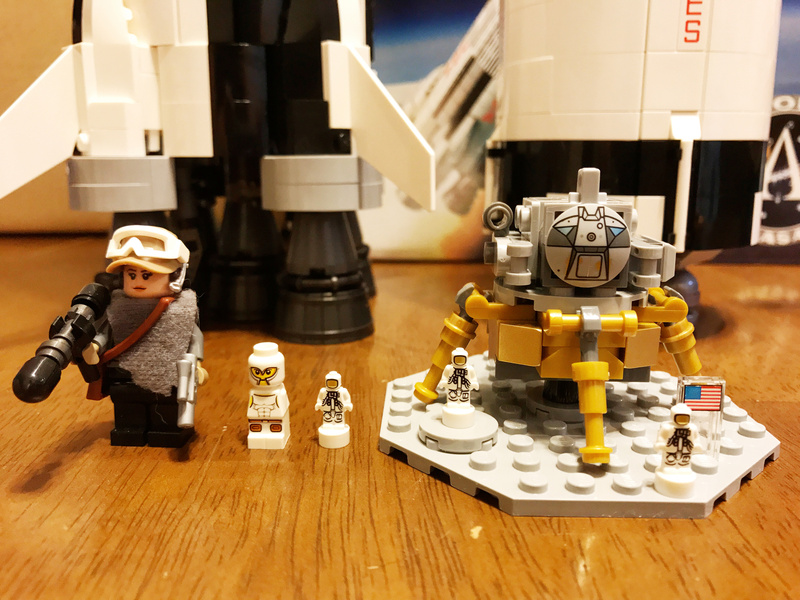 Here’s a scale comparison of, from left to right, the Jyn Erso minifigure, a microfigure from one of the Lego board games, and one of the astronaut nanofigures from the Saturn V set. The set actually includes four of these, I guess on the assumption that one may get lost. As always, the set included a few extra bits and bobs, duplicates of the smallest and most easily lost pieces. 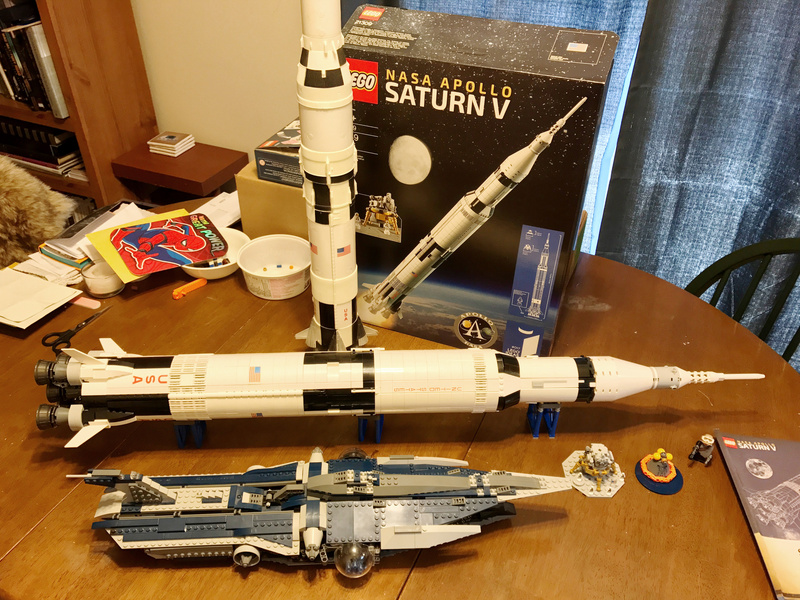 One more scale comparo, this time with the LEM and astronauts next to the gigantic F1 engines that powered the Saturn V’s first stage. There are F1s on display in weird places, including one here in LA that I haven’t seen (list here). The one I’ve seen the most recently is at the Science Museum Oklahoma in Oklahoma City. It’s a mind-bogglingly impressive piece of equipment. One more comparo – up until now, the Lego Star Wars 9515 Malevolence space dreadnought was London’s and my longest Lego vessel, at something like 76 studs. As you can see here, the Saturn V makes it look downright cute. That’s it. As far as I’m concerned, this is the apotheosis of Lego sets. 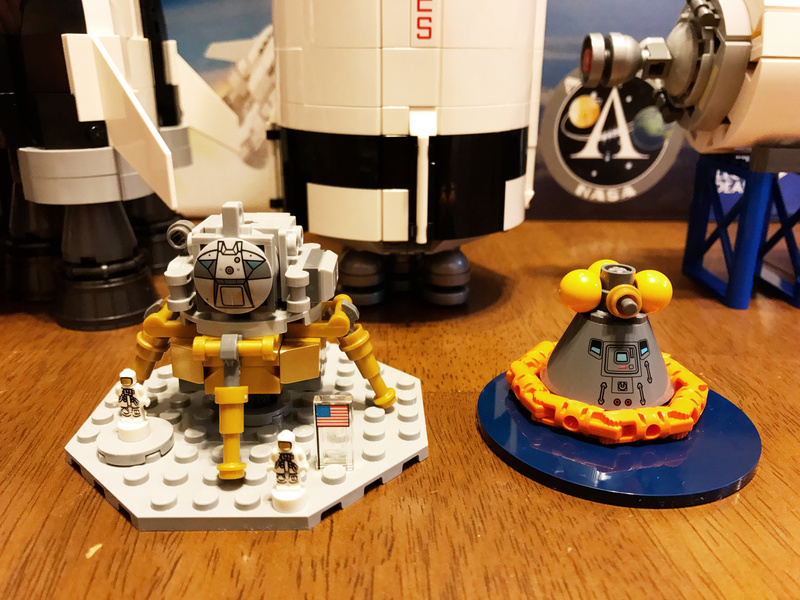 If you are remotely interested in Lego, the Apollo program, rockets, or just cool things in general, set up an in-stock alert and get one. You won’t regret it. Since posting this, I’ve seen a lot of hand-wringing about the set being out of stock “forever”. The Lego Group has said that the set will remain in production through the end of 2017 at least. So they will come back. Set an in-stock alert and be patient. The box that the Saturn V comes in is just big enough to store the assembled model if you separate the stages and snap the fins off the first stage. I put some bubble wrap between the stages and used a little box for the dioramas and blue pipe stands. This will come in handy – I want to take the model to the next PVAA meeting for show-and-tell, and I also want to be able to store the thing without taking it all the way apart. 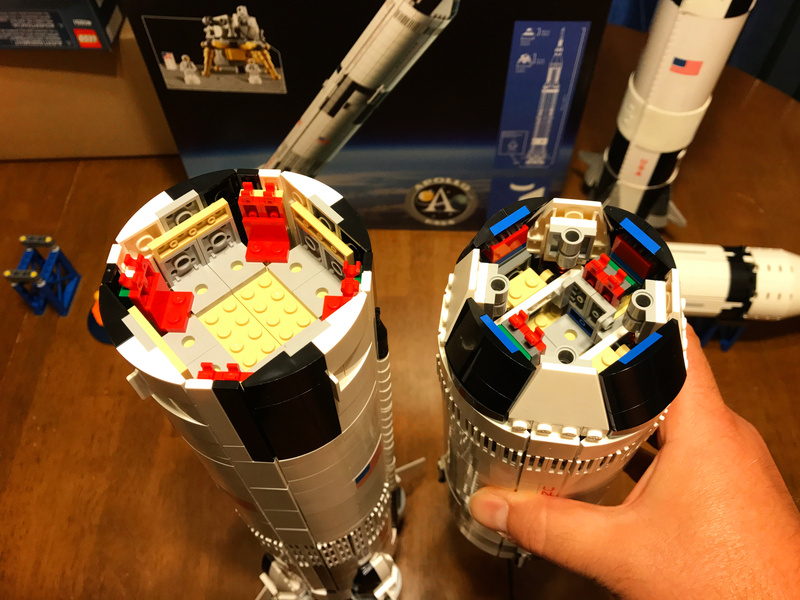 The same team that created the original Lego Ideas Saturn V now has a scale umbilical tower to go with it. 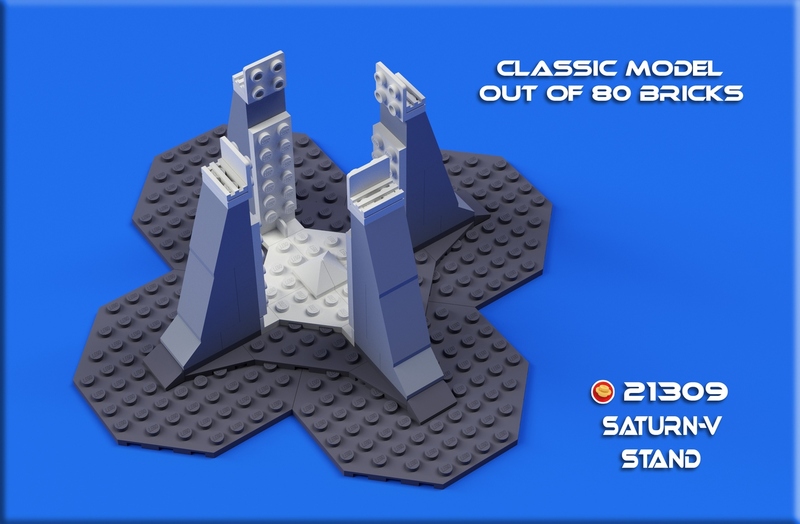 As of this writing, the umbilical tower has accumulated 7648 of the 10,000 supporters it needs to be considered for official release as a set. Personally I’m skeptical that Lego will produce a whole set that only works with a previous set, but stranger things have happened. Anyway, it definitely won’t happen if the fan set doesn’t get to 10,000 supporters, so if you ever want to see this made, get on over to Lego Ideas and do the right thing. Finally, on the same page, go to the Updates to find photos and instructions for building a robust support stand for vertical display of the Saturn V. Looks like something worth doing. Will post when and if I get around to it. Adam Savage and team build the Saturn V at Tested.com. Advice on taking the Saturn V apart: disconnect the third stage first. Why? Because the connection between the first and second stages is really solid, and when I pulled them apart last night, they disconnected with such a violent *POP* that the third stage/CSM/escape rocket stack popped off the second stage at the same time, executed a perfect ballistic trajectory to the dining room floor, and experienced rapid unscheduled disassembly. It only took about 10 minutes to get everything back together, and now you know the correct way to separate everything without breaking yours: third stage off first, then second stage, the reverse of the actual staging during flight. Trust me on this. You are currently browsing the 10 Minute Astronomy blog archives for the day Wednesday, August 2nd, 2017.